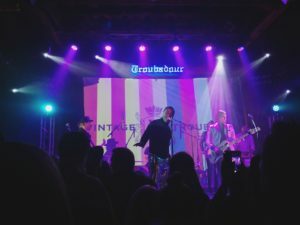 On an average night in Los Angeles, there is always much to do and show sacrifices to make, but you always know that a good time is going to happen when Vintage Trouble are involved. That’s because these hometown heroes know how to put on a good show and they brought their bluesy and retro rock ‘n’ roll soul out to play for a show packed with of all the songs the that the sold-out crowd wanted to hear, plus ones off their new record, Chapter II – EP 1. 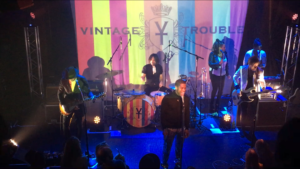 Vintage Trouble’s live shows definitely rank up there as some of the best for the obvious reasons: they are a notoriously tight band thanks to the top-notch musicianship from guitarist Nalle Colt, bassist Rick Barrio Dill, drummer Richard Danielson with Ty Taylor slinging vocals. Aside from bringing incredible showmanship to the stage, Taylor actually brings it directly to the audience and tonight was no different. 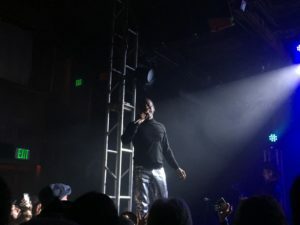 From jumping in the crowd to running up to the Troubadour balcony while singing “Run Baby Run”, from crowd surfing during “Knock Me Out” to spinning in circles (and encouraging others to join him) during “Blues Hand Me Down,” it was a high energy show from start to finish and the audience loved every minute of it. The band had a couple of softer moments such as when they performed “Nobody Told Me” which was definitely a highlight. It’s always great to be in a room where fans appreciate the music, but it’s even greater to be in a room when you can feel how much the band appreciates their fans. 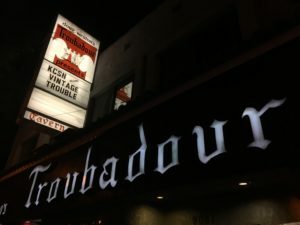 Even with so many other shows happening all over LA this night, live music, the rock, the roll, and the soul were all alive and well in at the Troubadour that night thanks to Vintage Trouble and there’s no place that I’d rather have been.